-56*, you need to know you've got a cover you can rely on. That was the thinking behind the British Antarctic Survey Team's decision working in conjunction with Morrison Construction (part of Galliford Try the FTSE quoted construction company) to enlist the help of Southampton based specialist cover maker Custom Covers when they set up camp recently on Antarctica's Brunt Ice Shelf. The long-term expedition to study atmospheric sciences, geology and glaciology means the survey team must live and work in one of the most inhospitable places on earth: the South Pole. 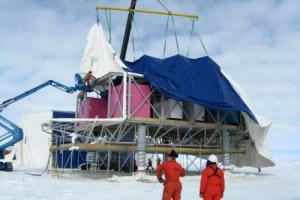 A cluster of 6 personal modules is in the process of being built at the Halley research station in Antarctica. 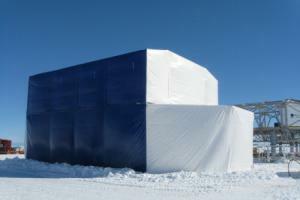 At the conclusion of this arctic summer the modules will be half built and the project called for temporary covers to protect the half built shelters from the Antarctic winter. When it came to designing the covers required for the job Custom Covers had to address a series of unique challenges, most of which it hadn't come across before in its 25-year history. "We aim to make covers for absolutely anything", says Custom Covers chief executive Robert Sanders "and this project proves it. We did a lot of research to come up with a fabric that was capable of withstanding extreme weather conditions, and a design that would be incredibly durable and prevent spindrift getting through the cover and into the team's equipment turning it to ice." When it came to putting the structure together, it quickly became obvious that traditional joining methods were unacceptable, and designers had to find a way of constructing each cover in one piece. "Once we had a design that had been agreed by the customer," explained Simon Bell Custom Covers technical director, "we had to have each cover computer cut and then put together by a team who worked day and night, and through many weekends, to get the job done. Bear in mind that each cover took 3 weeks to construct from start to finish, used 1400 square metres of fabric and weighed just over a ton a piece, so it really has been an incredible achievement. In addition we worked to a very limited timescale as installation at point of delivery had to take place before the onset of the Antarctic winter. The last cover was finished just hours before the shipping deadline and it took 15 people to pack them into their containers." Custom Covers employs staff with a high technical skill level, able to make temporary shelters to customers' exact requirement and specification. From canvas work for the marine trade to top end marquees and now covers for Antarctic expeditions, the company puts no limits on what it can produce. Recent other specialist work done includes the design manufacture and fitting of ceremonial awnings on the back of BAE/VT manufactured Type 45 destroyers, and specialist cover work for Lockheed Martin; but this South Pole project is one expedition into unfamiliar territory the team is unlikely to forget.